The Dodgers needed that. The fans needed that. The ANNOUNCERS needed that. After playing so many ~4:00 hour games that it started to feel like standard practice, the Dodgers played a relatively tidy but nevertheless drama-filled 1 run game- that’s “1 run game,” as in 1 TOTAL run for the entire game. Adrian Gonzalez’s home run provided the Dodgers with the only one they’d need, against starting pitcher Kyle Kendricks. Ask, and ye shall receive. Far from being decent, Kershaw and Jansen were downright dominant, hitting their spots, and for the most part, keeping the Cubs off balance. To be sure, there were a few good swings against Kershaw in the later innings, but in some respects, it seemed part of his game plan- he’d been used so much recently, he needed to keep his pitch count down, meaning that he had to pitch to contact more than usual. Trusting his defense, combined with a little bit of luck- and a LOT of luck, on that final warning track shot from Javy Baez- Kershaw was masterful, and gave the Dodgers a much needed win, with a huge assist from Kenley Jansen. And how about that Jansen? Not even three full days after he’d thrown the last of a career high 51 pitches to the Washington Nationals in Game Five of the NLDS, Jansen looked as dominant as he had all year for TWO full innings of work, and had done so against one of the best offenses in all of Major League Baseball. Even more incredibly, he was getting ready to throw in the seventh inning, before Kershaw talked Dave Roberts out of taking him out of the game- which brings us to where the rabbit’s foot comes into play. Jerry Hairston Jr. mentioned on Twitter how Kershaw would always “win” arguments with Don Mattingly to remain in the game. It’s completely understandable why the best pitcher in baseball would have the right to stay in, if he felt he could get the job done. And of course he always believes that he can, because if he didn’t, he wouldn’t be the best pitcher in baseball. On the other hand, it puts the manager in a really difficult position. If the job gets done, we sing Kershaw’s praises. If it does not, it’s the manager’s fault for not doing his job, in seeing how “obvious” it was (after the fact) that Kershaw had nothing left in the tank. Game 2 of the NLCS initially looked no different than a few other recent postseason shockers, only this time, Javy Baez’s rocket launch towards the outfield did not land in the gap, or over the wall, but safely in Joc Pederson’s glove. The baseball gods were in Dave Roberts’ favor, and with the maniacal laugh that he let out at the end of the inning, it was clear that he knew it. To the extent that there is such a thing as a “must win” Game Two in a Best-of Seven series, this was it for the Dodgers. The Dodgers going back to L.A. down 2-0, knowing that Clayton Kershaw wouldn’t be pitching for at least two games (even with short rest), would have been a next-to-impossible task, with a starting rotation that has not been particularly effective so far. But now that the series is tied and they’re going back to their home turf, there is a real chance this turns into an all-time classic, poised to eventually head back to Chicago. But at Dodger Stadium, the Boys in Blue better get more out of their starting pitching, as it’s unlikely they can win more than one bullpen-by-committee game against the team with the most wins in Major League Baseball. They’ll also need some middle relief to step, as Kenley Jansen will not be able to go for six out saves every night. Then again, with all the improbable outcomes we’ve seen over the past few months since Kershaw initially went down, it’s foolish to dismiss anything at this point. I’m half-expecting Mickey Hatcher to circle the bases at some point. Dodgers vs Cubs, Game 1 NLCS Recap- What Kind of Manager Is Dave Roberts, Anyway? Looking at the rosters for the two teams on Opening Night of the National League Championship series, one might wonder how the Dodgers could possibly win Game One, particularly with postseason legend and potential Cy Young award winner Jon Lester going for the 103 game winning “Lovable Losers”. For those who ended up watching the game, one might wonder how the Dodgers ended up losing. The team hit into an astonishing six line drive outs, which actually accounted for seven outs total, given that the one which ended the game was a double play off the bat of an unlucky Chase Utley. That doesn’t even account for the line drive single from starting pitcher Kenta Maeda, ultimately resulting in the fateful out of Adrian Gonzalez at home plate. But for a short time late in the game, the team who had been beating the odds since Clayton Kershaw’s season altering injury- that is, altering in a good way, somehow- seemed poised to do it again. Even with all the bad luck- and great defense, particularly from Dexter Fowler- the Dodgers appeared to be copying the script from the fateful NLDS Game Five against the Nationals, knocking a potential Cy Young award winner out of a game, scrapping to comeback. With the Cubs leading by two, but facing a bases loaded and no one out situation in the top of the 8th, Cubs manager Joe Maddon went to closer Aroldis Chapman an inning earlier than usual. (Wait- he’s with the Cubs now? I can’t keep up anymore. Anyway…) Chapman made fairly easy work against a sadly struggling Corey Seager, and a sadly declining Yasiel Puig. Up stepped Adrian Gonzalex, who hit…you guessed it…a line drive. This one was not caught, and suddenly, we had a tied game and a quieted Wrigley Field. But unlike the deciding game against the Nationals, this time, the shocking late inning comeback only resulted in a tie, instead of a lead. In other words, it more closely resembled the setup for NLDS Game Four, when the Nationals tied the game after a Clayton Kershaw exit at Dodger Stadium, only to have Chase Utley put the home team ahead for good. But this time, the Dodgers were the road team, ending up on the wrong end of the emotional roller coaster ride. Like the Nationals at Dodger Stadium, they almost escaped the bottom half of the innings unscathed. Almost. But a couple of intentional walks would ultimately seal the Dodgers’ fate. If the Cubs end up in their first World Series appearance since the end of the previous (and hopefully last ever) World War, this series of moves will be discussed for a very, very long time. But why wait ’til later to try figuring it all out? We here at DodgersFYI have made it perfectly clear that the entire staff are fans of Dave Roberts- all one of us! Of the many, many, MANY roster moves that the front office has made over the past year, signing him has been the best one. He is at least as good of a “player’s manager” as Don Mattingly was, and certainly superior to him from a tactical standpoint. The Fox Sports broadcast showed an incredible stat during the course of the game- prior to 2016, of the five teams that had the most single season pitching changes in baseball history, the MOST wins one of those teams had was 73. Dave Roberts’ squad had more pitching changes than any of them, and somehow managed to win 91. This is a man who knows what he’s doing, and if there’s any justice, he will be voted in as National League Manager of the year. Considering how instantly visceral fan reaction can get in the age of social media, the hostility towards Dave Roberts was comparatively mild. To be sure, there was lots of criticism in his direction, but he had a fair share of defenders, and the most heated rage was aimed in Blanton’s direction, for throwing such a lousy 0-2 pitch. (I can only imagine what Vin Scully, who LOATHED hitable 0-2 pitches, would be saying!) And really, it would be nice to live in a world where everyone didn’t want to fire the manager after a single move backfires, no matter how critical that move is. But given how much Roberts has dealt with this season, and how well he’s handled it, no rational person can POSSIBLY consider him a lost cause after this. Going forward, the scrutiny of Roberts’ gambles will come into more focus. Consider how pundits and fans alike have profusely praised his use of Clayton Kershaw and Kenley Jansen as “gutsy”. Without reliving the entire previous two postseasons, at least recall the 7th inning of the 2014 NLDS in St. Louis, an inning that cemented many (if not most) Dodger fans’ hearts and minds about Don Mattingly’s ineptitude. With a 2-0 lead, Clayton Kershaw gave up two relatively cheap back-to-back singles to the St. Louis Cardinals. With Matt Adams at the plate, Kershaw threw the worst curveball of his career to a left handed hitter, and it ended up going over the wall. But most of the blame went to Mattingly, for supposedly overusing the Dodger ace. That “overusage” of that NLDS was NOTHING compared to what we’ve seen in 2016, with Kershaw throwing pitches into triple digits on short rest, then coming back two days later to close out the series. As for Jansen, he threw 51 pitches in that same game, by far a career high. You have to go back to Joe Torre, leaving Jonathan Broxton to wilt against the Yankees on 48 pitches in 2010, to recall such heavy usage of a closer. Broxton then got several days off, but the 2016 Dodgers don’t have that luxury- not when they’re already down 1-0. Luckily, he’s already had two days off, so perhaps he will be ready for game 2. He’d better be, because while “anything can happen” is one of the most cited mantras of Major League Baseball, it’s impossible- not nearly impossible, but completely impossible- to imagine the Dodgers advancing, without at least decent performances from Kershaw and Jansen, throughout the rest of the series. To put it another way, the chance of everyone forgetting about the bases loaded gamble, is tied directly to how the (over? )usage of the Dodgers’ two best pitchers effects them, going forward. The Dodgers offense was far better than the box score indicates, and the fact that they didn’t give up, even in the 9th, is very encouraging. But Dodger fans can be forgiven for feeling a little bit concerned, if not downright morose. For nearly a decade now, in spite of all the roster changes, front office changes, even ownership changes, the Dodger postseason always seems to follow a pattern. Since 2008, each postseason the Dodgers participate in contains at least one dramatic, “I WAS THERE!” triumph, and at least one gut wrenching, heartbreaking defeat. Given how this franchise hasn’t won it all since 1988, the heartbreaker always comes last. It remains to be seen for 2016’s Boys in Blue, whether the heartbreaker that was NLCS Game 1, will also end up being a back breaker. Oh, where to begin. What can be said about the longest 9 inning game in postseason history, a game with a box score that looked like something out of spring training, where the closer recorded almost as many outs as the starter, yet STILL managed to not even close the game himself?! Actually, I think that last sentence says plenty- and they don’t pay me enough to recap everything that went into THAT game- whomever “they” may be, and however much “they” may be paying me…which is to say, absolutely nothing. Forgive the bizarre opening paragraph, but it just seems appropriate for such a bizarre game. The starting pitcher- who I think was Rich Hill, it’s hard to remember- didn’t last passed the 3rd inning. And let’s face it, if anyone had told you that the road team’s starter had been knocked out in the 3rd inning of a winner-take-all game, while the home team had the likely Cy Young award winner pitching a shutout into the 7th inning, you’d be reasonably sure how the game would end up…unless, of course, the road team was the 2016 Los Angeles Dodgers. Not to get ahead of ourselves, but this team’s success has been every bit as improbable as the 1988 squad to this point, perhaps even more so. That team at least had a solid starting staff. This team’s starting rotation was basically Clayton Kershaw and about a dozen question marks. (Literally a dozen- look it up! And who is Nick Tepesh?!) Granted, a few of those “questions marks” were talented- most notably Kenta Maeda and Julio Urias- but none could be relied upon to go deep into games, that is when they were even healthy enough to pitch at all. And yet, it was when Kershaw went down that the team really got rolling, mounting an incredible second half comeback, riding a bullpen-by-committee into a division title. Now, they have ridden a bullpen-by-committee into the NLCS. It wasn’t without some help from the other side, though. Taking some misguided advice from his third base coach, Jayson Werth ran into an easy out at home in the 6th, killing his team’s momentum, not to mention the inning. Joc Pederson wasted no time claiming that same momentum on the very next pitch in the very next inning, thereby ending the shutout, the tie, and Max Scherzer’s night. As it turned out, though, the Dodgers were just getting started. A seemingly endless stream of Washington pitching changes couldn’t stop the Dodgers’ momentum- nor could three straight failed sacrifice bunt attempts, courtesy of Charlie Culberson- with pinch hitter Carlos Ruiz ultimately giving the Dodgers the lead, and Justin Turner adding to it. This game was far from over at that point, however. After ex-Dodger Chris Heisey’s two run homer put the game within reach for the Nationals, Dave Roberts went to Kenley Jansen- in the SEVENTH INNING with no outs yet recorded. Without reliving the mayhem all over again, the most notable play on the Nationals’ side was Dusty Baker, a manager good enough to consistently get hired but not good enough to stop needing to look for work, ordering a sacrifice bunt- with the bottom of the order coming up, no less- while his team only had 6 outs left in the season. After a career high 51 pitches for Jansen, the game still had two outs left, while Jansen had NOTHING left. Dave Roberts then went to Clayton Kershaw- again, naturally- who had just thrown 110 pitches on short rest just two days earlier. The first batter up was relatively new Dodger nemesis Daniel Murphy, whose .438 batting average for the series was deceptively low. (That is not a joke.) Kershaw got him to pop up, then struck out the Nationals’ final position player remaining on the bench, to take the team to the NLCS, in a scene that was as exhilarating as it was exhausting. Thanks to their next opponent’s historical reputation of unprecedented futility in American sports, the Dodgers will likely not gain many fans outside of Southern California. But make no mistake- if there’s a real-life “Bad News Bears” in this series, it’s unquestionably the Boys in Blue, particularly with Jansen and Kershaw compromised for at least the beginning of the series. Sure, the media will play up the “Lovable Losers” angle for the Cubs, but this Cubs team happens to have the best record in baseball. Besides, for fans under 30, there’s really no difference between whether their team last won it all in 1908, or 1988. Truth be told, though, this is unlikely to be an important motive, if any motive, for Friedman to make these moves. Sure, even a “stats guy” like Friedman is bound to give in to human emotions once in a while, and it surely still hurts when he thinks about how close his team came to winning that year. (Who knows? Maybe Brad Pitt would have played him in the movies!) Nevertheless, the fact is, this team has made tons of trade during his tenure, and a few of them were bound to be with the Phillies. Each one has also proved to be somewhat justifiable- Jimmy Rollins was a defensive upgrade over Hanley Ramirez- not to mention one in the clubhouse- Joe Blanton has been a very good setup man in the bullpen, and Chase Utley has been the kind of player that you’ll someday get to say, “They don’t make guys like that anymore.” So, maybe Carlos Ruiz can add something to this team as well. 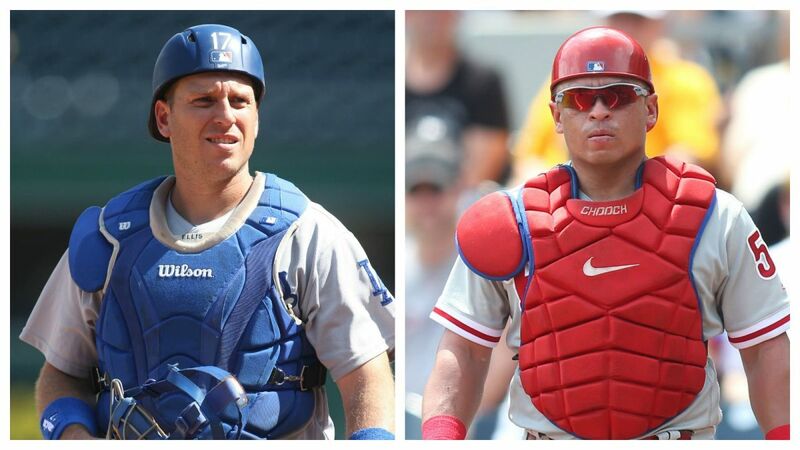 At the same time, though, this is not just an ordinary trade of past-their-prime backup catchers. AJ Ellis, a man who owes his entire existence to his great-grandmother literally missing the boat (and what a boat it was! ), worked exceptionally hard to improbably become the longest tenured player in the Dodger organization. By all accounts, he is one of the smartest men in baseball, and has been integral to the Dodgers success, since finally nailing down a permanent spot on the big league club’s roster in 2011. Additionally, he is Clayton Kershaw’s best friend on the team, and well liked by all. While Friedman’s previous trades of fan favorites worked out much better than most of us expected, this one carries the additional baggage that AJ Ellis was a team favorite. If keeping an easily-identifiable core group together for fans isn’t important to the numbers-minded executives running the Dodgers’ front office- and clearly, it isn’t- how about the risk of rupturing team chemistry? In fairness to Friedman, the Dodgers’ winning percentage has been good during his tenure so far, in spite of an almost unfathomable amount of injuries. (Seriously, how has this team managed to get into first place, using bullpen-by-committee?!) And given that a few of his most controversial moves have actually worked out- let’s face it, the Matt Kemp trade is increasingly looking like an outright victory for the Dodgers- there’s only so much outrage one can muster, before seeing the results of these transactions. But none of this means that the criticism shouldn’t be taken seriously, either. Also, while it’s dangerous to be sentimental in the age of free agency, so much roster turnover for the Dodgers really does make it feel like we’re rooting for a fantasy baseball team- someone else’s fantasy baseball team! Either that, or a roster from a Phillies’ Old Timers game, in the not-too-distance future. See? Jason Stark agrees with me! A couple of more Phillie-related notes- first, it’s incredible to think that for the second time in as many years, the trade of an iconic Phillie almost led to the Dodgers’ being no hit by the Giants. Whether a curse, a coincidence, or just letdown from losing AJ Ellis is anyone’s guess. Regardless, it’s something that you can expect to happen, about as much as you can expect to be struck by lightning twice. (Also of karmic note is that Ross Stripling was on the losing end for the Dodgers. You might recall that earlier this year against the Giants, Stripling almost made some very unlikely history of his own.) And finally, Adrian Gonzalez can sleep well for the remainder of the season, knowing Ryan Howard’s arrival to Chavez Ravine will probably have to wait until 2017, out of respect to Vin Scully. Sure, Friedman just defied Clayton Kershaw’s wishes, but good luck pulling that stunt on Mr. Scully, whom the Dodgers just renamed their MAILING ADDRESS to! What a difference two days makes. What a difference two PITCHES makes! After dominating the Padres in historical fashion, the ’27 Yankees 2016 Dodgers took their roadshow up north. Initially, it seemed to be more of the same, as the Dodgers took a 4-0 lead into the 5th inning at AT&T Park, a mere one inning away from the MAJOR LEAGUE RECORD for pitching the most innings of shutout ball to start a season. Ultimately, the team missed its mark. Boy, did it ever. Dave Roberts got his first taste of what it truly means to be a Dodger manager, in the post-Gagne era. With the team looking comfortably ahead against the Giants, Alex Wood suddenly became hittable, as we often saw in 2015. Rather than give him the early hook, Roberts stuck with his starter, only to watch the once comfortable lead become a deficit in the 6th inning. The somewhat debatable move of leaving Wood in too long was made moot by an all too familiar site- the Dodger middle relief, throwing gasoline on the fire, leading to the Dodgers’ first loss of the season. But those managerial decisions and pitching performances pale in comparison to what happened the next game, the fifth of the season for the Dodgers overall. Ross Stripling had an impressive minor league career halted by injuries, leading to Tommy John surgery. With the Dodgers’ rotation in dire straits, Stripling won out the #5 spot, albeit with little expected from him. That changed Friday night, in a game that will no doubt go down in Dodger infamy. It all started ordinarily enough, with the rookie battling command issues, rookies often do. When he DID get the ball over the plate early on, the results didn’t seem anything special. Sure, he hadn’t allowed a hit, but that was largely thanks to spectacular plays by Joc Pederson and a newly revived Yasiel Puig. But as the game continued and Stripling settled down, his performance got stronger, to the point where Stripling did something that hadn’t been done since a previous century. That’s a previous century, not THE previous century, as in the 19TH century- in front of friends and family, including his fiancee, Ross Stripling had taken a no hitter into the 8th inning. The whole thing seemed surreal, as Dodger fans wondered if the 26 year old could really do it. We’ll never know. The Fire, Or The Frying Pan? One of the great ironies of the night, for an organization that seems to specialize in irony these days, is that the move to take Ross Stripling out of the game wasn’t as controversial as it initially seemed. He was at 100 pitches on a cold, rainy night, still recovering off of a potentially career threatening surgery. Had he been at 100 pitches in the 9th inning, it would have been a different story. But given that there were 5 outs left, new manager Dave Roberts was in an extremely tough spot- imagine if Stripling had gotten another 2 or 3 outs, but needed 20 pitches to do it. At that point, he’s in the 9th inning at 120 pitches, at a point where Dave Roberts REALLY has to make a brutal decision- take him out, to preserve Stripling’s career while denying a chance at Major League history, or leave him, and risk another Johan Santana situation, minus Santana’s financial security. Roberts’ deserves credit for making a difficult decision, and not being phased by public pressure in doing so. The initial reaction of Twitter was actually fairly supportive of Roberts, given the circumstances, along with the fact that Roberts is a new manager, with a certain Doc Rivers-style gravitas that his predecessor seemed to lack. However, the result of the decision seemed all too Mattinglyesque- on the second pitch from reliever Chris Hatcher, the Giants did something they hadn’t done in the previous hundred against Stripling- they not only got a hit, they got a hit over the fences, tying the game at two. After working so hard to get out of the doghouse last season, Hatcher managed to get right back in it, on one lousy pitch- and we do mean lousy! Hatcher seemed to realize it, too. After being squeezed by the home plate umpire on the next pitch, he lashed out in a way that probably had little to do with the pitch. Dave Roberts came rushing out of the dugout, protecting his pitcher, getting himself ejected from the game in the process. It’s just as well, because he probably didn’t want to be in the dugout at that point, anyway. At that point, the baseball gods turned against the Dodgers quite viciously. A couple of well struck fly balls in the top of the 9th died at the warning track. Against Joe Blanton in the 10th, Dodger nemesis Brandon Crawford’s did not. Game over. Many fans are also seething about Kenley Jansen not ever being brought into the game. The argument about bringing closers into tie games on the road has gained serious traction in recent years, which is the height of second guessing. Making this move at the “right” point is totally arbitrary, because it guarantees that either the manager will be bringing in middle relievers later in the game, or will be wearing out the closer’s arm. If this philosophy had been embraced for this game, Jansen would have been brought into the 9th inning, meaning those middle relievers that have everyone fuming would have been seen in extra innings, anyway. It is a no win situation. Literally. Less second guessing goes into the argument about Joe Blanton. He should not be on the roster, let alone in this game. Watching sabermetric bloggers convince themselves that the Blanton signing was a good one, supposedly based purely on analytics instead of loyalty towards Andrew Friedman, was either amusing or infuriating, depending on one’s point of view. (I’d highly recommend seeing it as amusing- it’s much healthier that way.) Keep in mind this conclusion was based on two admittedly outstanding months from Blanton with the Pirates at the end of the 2014 season. Also keep in mind that this is from the same group that dismissed- to the point they even acknolwedged- two outstanding months from Matt Kemp in 2014, with a much larger sample size than Blanton’s…not to mention an overall career far more distinguished, as well. Some of Friedman’s moves might be vindicated at the end of the season. This one almost certainly won’t be, and if the Dodgers need to go to Blanton in other critical, non-Kenley situations, they’re in trouble. In spite of two losses in San Francisco, every bit as dispiriting as the three wins in San Diego were dominant, there are a lot of good signs for the Dodgers so far. Stripling and Kenta Maeda are the obvious ones. The “good” Scott Kazmir showed up for his Dodger debut, and Alex Wood at least looked decent through most of his start. Nearly everyone is hitting, and quietly, Yasiel Puig has returned to from- an amazing feat, considering Yasiel Puig doesn’t usually do ANYTHING quietly. Oh, and Clayton Kershaw will be pitching the next game for the Dodgers. So, there’s that. We’ll need to see the rotation a full 3 or 4 more times before we can reasonably conclude what this team is capable of, but the earliest indications seem to be that the 2016 Dodgers will be a force to be reckoned with. Just don’t get too comfortable, until you hear this song playing in the 9th inning!